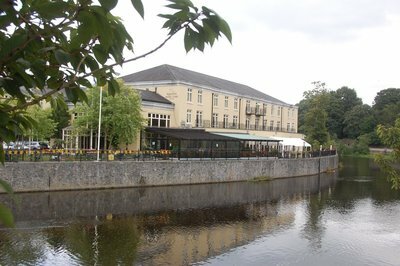 We had a superb dinner last night in Bunclody and after a reasonable nights sleep and a good breakfast, we were on the road south to the Wexford area by 0930, to the Irish National Heritage Park. 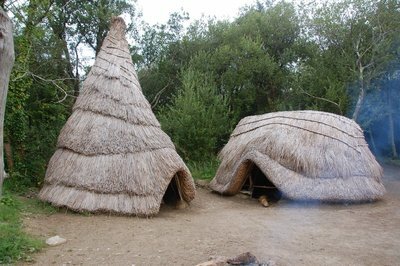 Although all the exhibits are reconstructed, this site is a must if you want to see the progression of Irish history through time. Our tour guide Paul, was superb and his presentations were fluid and influential. Johnstown Castle Gardens for some lunch at the Tea Room. The castle itself is not open to the public, but it can be used for weddings. 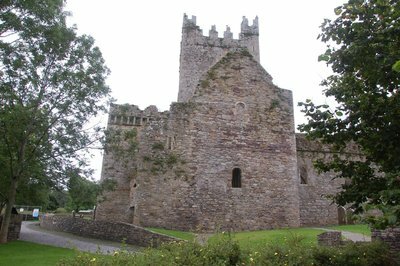 It's then back on the road to Jerpoint Abbey, another 12th century ruin. It was easy to imagine celebrating mass in this wonderful structure. 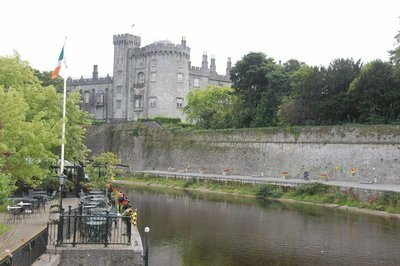 After the abbey, it was a short trip to the Killkenny Castle. Although the structure is impressive from the outside, the restoration and furniture that has been reinstalled in the castle wasn't that impressive. It was lived in until the early 1900's. We finished the tour and headed to our hotel for the night before heading back to Dublin in the morning for the Navy Notre Dame Football game. After a trip back to the airport we picked up our Hertz rental car (diesel, automatic and with GPS). 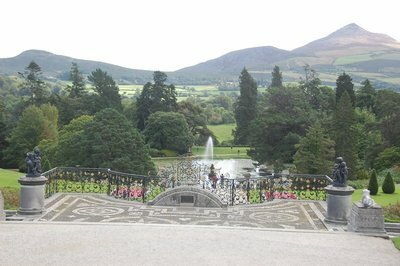 Our first adventure out on our own was to Powerscourt House and Gardens, just south of Dublin. 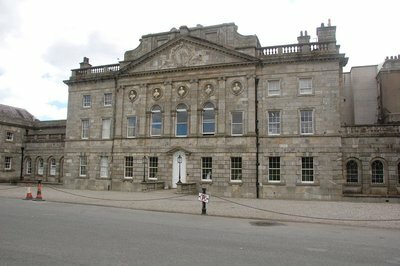 To us it seemed like Dublin's version of the Biltmore - spectacularly beautiful. Interestingly there is a Ritz-Carlton hotel right next to the gardens - on my list for the next trip. 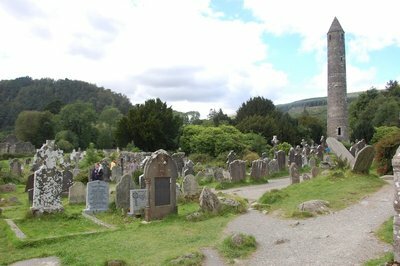 We then headed to the 11th century ruins of Glendalough - a wonderful little ancient borough. It was then time to head to our hotel for the night in Bunclody - another great little burb just north of Wexford. 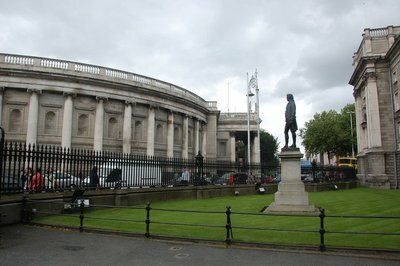 After sort of a hectic day of travel under two different airline tickets, we arrived in Dublin at 0520 this morning. The flights over were fine, but those who plan on traveling through Boston need to plan for about 3 hours to check in at the International terminal and go through security, especially if you want to stop at the Duty Free shop. It was a madhouse in Boston. Of note was on the short flight (5 hours) from Boston to Dublin, the food in business class on Aer Lingus was excellent as was the service. It was a wonderful way to get to the Island. On board the flight were a bunch of my clients and many others, including two HS football teams who were going to play as part of the weekend of football in Ireland. The Irish are even more excited because the semi-finals of the Gaelic Football tournament are on Sunday. Both the Navy Notre Dame game and the Gaelic Football game are a sellout. After a few hours of sleep, I had hired a 3 hour private tour for the afternoon. Promptly at 1400 Catherine and our driver showed up and we had a wonderful tour of Trinity College, including the Book of Kells and the highlights of Dublin. A good nights sleep tonight, pick up the Hertz car tomorrow and off to Wexford during the day. I and a group of 32 more folks leave for Ireland on August 28th for a tour of the country and the Navy Notre Dame Football game which is being played in Aviva Stadium, home of the Irish Rugby League. This is a repeat of the same game that was played in 1996 - the Shamrock Classic. I went to this game and we had a great time. The first interesting note is that most Irish car rental companies - including Hertz - do not accept any third party insurance coverage such as travel insurance, USAA, American Express card etc. We have paid for basic CDW, but the deductible for that coverage can by up to 2500 Euro - nearly $3000.00. We will likely pay for the super CDW directly with Hertz which adds about 20 Euros per day to the cost. Even though one of our drivers has driven on the left hand side of the road for several years, it still seems like a good investment. I have also pre-purchased a bunch of tickets, which saves you 10%. 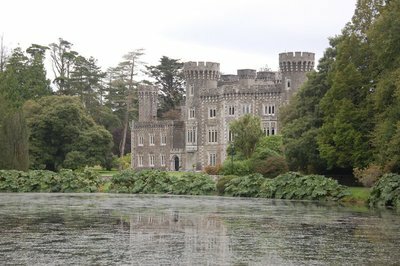 This includes the Library at Trinity College (book of Kells), the Guiness Factory, Waterford, Kylemore Abbey and Blarney Castle. Hopefully it will save a few minutes in line also! Looking forward to the homeland of my Mother's family and forty shades of green!